Apropos this, the unit that’s $31K more expensive isn’t even nice. In fact, it’s in worse shape than its neighbor, because it’s been smoked in, so quite literally it stinks. It’s going to need to have all the carpeting removed and a thorough deep cleaning (every surface from the ceiling down will need to be scrubbed) and repainting. The other unit only really needed some de-carpeting. Even for someone who doesn’t hate carpeting like I do, the fact that it has carpet which was installed in the past few years is irrelevant. Virtually nobody wants to live with carpet that reeks of cigarette smoke, and such an odor is virtually impossible to remove without removing the carpeting itself. The seller probably thinks s/he is entitled to be compensated for the cost of installing the carpet. That’s not how markets work. If you invest your money unwisely, you can and probably will suffer financial loss. And spending a lot of money on expensive carpet and then smoking inside is an unwise investment: two-year-old carpet that’s been ruined by the stench of cigarette smoke is every bit as much dumpster fodder as dated, twenty-year-old, threadbare carpet. So it’s almost certainly not going to sell anytime soon, because the seller is sufficiently detached from reality to believe she can get a price anywhere near what she is asking. It’s going to linger on the market for months, either selling when the seller finally accepts reality, or not selling and being withdrawn from the market. Either way, I won’t be moving into it any time soon. I don’t completely agree with everything said in it (it’s too dismissive of radical analyses), but this article is in general very accurate and makes some points I have made here myself previously. Warning: it’s not exactly brief. Since I missed out on being one seller’s doormat, there hasn’t been anything even remotely of interest come on the local market until this week. Now there’s things of interest, but only remotely. One is in an area of 4-plex condos that I’d actually jump on in a heartbeat if the right one came up. Unfortunately, this isn’t one of the right ones. Instead of backing onto a pond like some of its neighbors, it backs onto a commercial parking lot, complete with dumpsters. Which means commercial trash collection making enough noise to raise the dead at or before 6AM at least twice a week. No thanks. The other is actually right next door to the one I linked about in the first paragraph, and is in fact its floor plan an exact mirror image of the other. However, its the interior is nowhere near as tasteful, and the seller is asking $31,000 more for it than his or her neighbor did. Because, of course, it’s almost-brand-new banality and he/she expects to get his/her money back. The latter may happen, but it won’t happen with my money; the only way I’ll make an offer on this property is if it sits unsold for a while, then I’ll make a lowball one. And frankly, it’s not $31K nicer even if one discounts aesthetics and rates the two interiors the same. It’s about the same age as the other interior. So it looks like this seller is looking for a doormat, too. 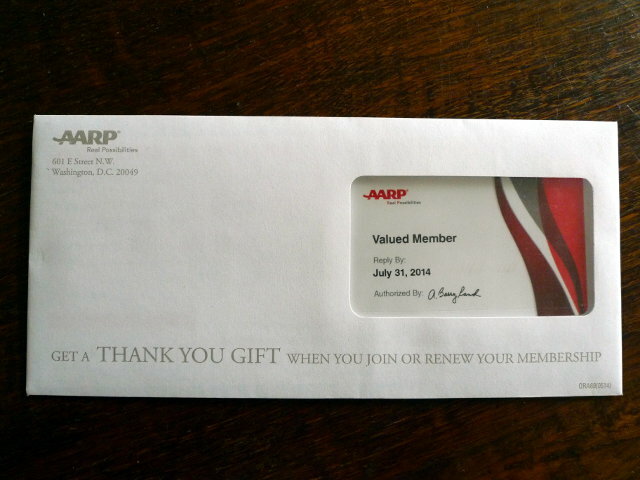 Once you start getting these in the mail, you are officially “old”. Actually, I’m surprised it took that long. I’ve heard they typically show up before one’s 50th birthday. This didn’t show up until after my 51st. And I plan on joining, because the AARP is one of the more effective lobbying organizations fighting against proposals to gut Social Security. You’ve helped to cement my move out of your city that I made last year by helping to ensure that I won’t be moving back any time soon, thanks to making the sort of housing that would appeal to me illegal to build. I’ve never really been able to understand this Seattle mindset that there’s basically only two types of housing that residents should be offered: large houses on large lots and apartments/condos crammed up against busy streets. And if you don’t want (or cannot afford) the former (what’s wrong with you, weirdo? ), then you deserve the latter. It’s an attitude that befits a neurotic suburb, not a major city. Despite the claims of the techno-futurists, taxis still very much serve useful purposes that services like Uber and Sidecar cannot fill. Two more examples is anonymity and universal access. In order to use the new ride-sharing services you must own a smart phone and register ahead of time. No anonymity, and if you don’t have an expensive phone (or if you’re traveling internationally and don’t want to shell out for a local phone contract or pay extortionate roaming fees) you’re SOL. I have no particular loyalty to the taxi industry. Find a way to replace it that preserves the above things and I’m all for it. Until then, however, there is a public interest in preserving taxi service. I made a strong and generous offer on a condo that actually met most of my standards yesterday. It was not accepted. So be it. It’s a competitive market for buyers, so I’m willing to make strong offers promptly. I am not, however, willing to be a seller’s doormat. This particular seller wanted an open-ended rent-back at generous terms (basically, I’d run a slight loss while she was my tenant). If that’s the sort of crap I have to agree to in order to become a homeowner in today’s market, I don’t want to be one. Mind you, I’m not giving up quite yet. I’m still keeping an eye on the market and will make offers on other suitable properties as they become listed. But if I keep running into stuff like this, forget it. Ownership is merely a tool, not an end goal. Other tools exist. Here’s some comments on this gallery of photos released by the Establishment media. I hope they don’t add or delete pictures and thereby change the numbering. I suppose I could have mirrored them here, but that would have taken time, particularly if I had mirrored the captions (which are truly required as part of this critique). No. 3. This is missing the context of what happened. The “superheroes” decided to first attack the protesters (myself amongst them) without warning or any apparent provocation. Note the partial view of the red “superhero” 3/4 of the way up and left of center; he had just charged without warning. The purple one was being tackled before he could likewise charge. I know; I was there. That’s my bicycle in the picture. No. 7. Note the passive voice, as if the pepper spray suddenly materialized as a force of nature out of nowhere, sprayed by nobody. No. 15 is actually pretty fair; it talks about “a protester” smashing the window, not “an anarchist”. Yes, there were many anarchists in that crowd, but that march had no political affinity test one had to pass to be eligible to participate in it, and a fair number had decided on the spur of the moment to participate. Absent a positive identification of the individual who damaged that window, and his or her political orientation, it’s not possible to say if it was smashed by an anarchist or not. I assume here that the window actually was smashed, and not damaged in some previous incident well prior to the march; perhaps I am being overly generous in my assumption. No. 18. A “tussle”. No, he attacked without warning. No. 22. Note the street sign in the background: 6th Avenue. That’s west of the Convention Center, where the attack pictured in No. 3 took place. The march was heading west at the time. So that photo was post-attack, an attack by the individual being flipped off. Offensive though it may be, a raised middle finger is not a violent act and is in fact protected free expression, and the context in which that gesture was made means it actually showed a degree of restraint (an obscene gesture was made, instead of a retaliatory attack). No. 31. But why were the media censored? They don’t say. Answer: corporate media have shared their full footage with law enforcement in the past. So their cameras are effectively police spy cameras. No. 41. This guy looks more “stunned” than “enraged” to me. If he was “screaming” wouldn’t his mouth be wide open? Instead he appears to be biting his lip in restraint. I ran an experiment of sorts yesterday. I deliberately chose to be as visibly anarchistic as possible (in the sense of what popular stereotypes about anarchist dress and mannerisms are), yet at the same time to scrupulously avoid causing any sort of lasting damage to any living beings or inanimate objects, and to refrain as much as possible from participating in any physical conflicts or clashes. You see, I normally don’t dress all in black at demonstrations. It’s something I regard as trite (and, face it, it is trite). So yesterday’s experiment was to get an idea, by personal experimentation, of just how much repressive measures are directed against anarchists per se, as opposed to any unlawful conduct by individual anarchists. I don’t normally find myself the least bit personally at risk, even at demonstrations which are later portrayed as violent or unruly. How much of that immunity is the result of not adhering to stereotypes and thus being seen as not an anarchist and therefore not “deserving” repression? And after narrowly avoiding getting injured or arrested in what can only be described as a brief police riot, and then again avoiding injury pretty narrowly when one of the so-called superheroes assaulted the march pretty much at random and without provocation, well, there’s the answer. At neither time did I note any violence or property damage happening before either group attacked the march without warning (had I observed any such things, I would have physically distanced myself from them). That’s not to say that neither happened, only that neither happened near me; both conflicts were initiated not by myself or any other anarchist but by forces in opposition to us. And note, this Seattle May Day is being reported in the media as tamer than other recent ones. I’m 51 years old, I marched in both the permitted immigrants’-rights rally and the unpermitted anarchist/anti-capitalist one. I wore black and chanted anarchist slogans. I am hardly perfect, nor in my estimation particularly effective, but I have not sold out. Quite the contrary; I’m more radical now than I was in my twenties. Not because I sought out radicalism as a goal but I kept observing the world around me and thinking fearlessly about it. In short, I am winning.I am winning because I have not sold my life away. Yes, I have a professional job that pays well, but my career is merely something I do to get by in this world, not my identity. The high-tech salary the system pays me can buy my labor but it can’t buy me. My mind is still my own, and I do not love Big Brother. I could write many more things about today, but this will suffice for now.